BabylonToolbar by BabylonToolbar - Boost Your PC. 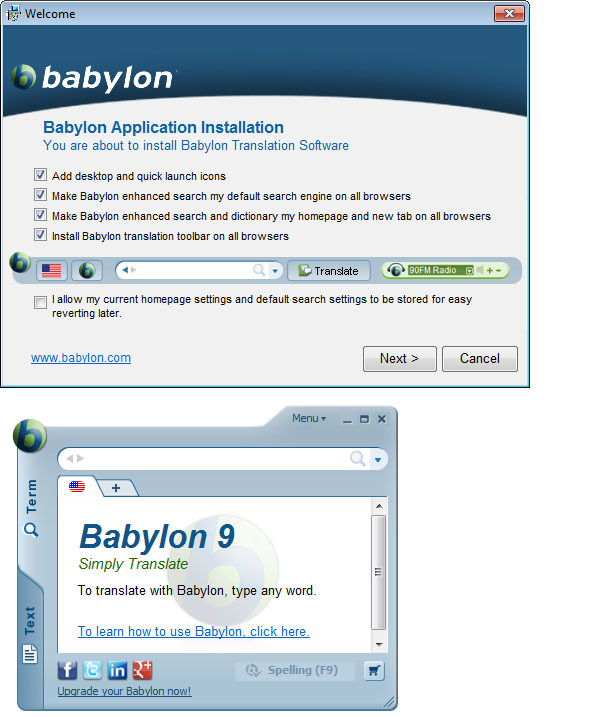 Babylon Toolbar from Babylon Ltd is a web browser plugin that allows you to get language translations and definitions through an installed web browser toolbar. Typically, the Babylon Toolbar comes bundled with other software, usually freeware and shareware. Before installing the toolbar, users have to agree to end user software agreement and accept all the changes that will be made during the installation. This web browser toolbar can change the default search engine provider; however, you may leave this setting unchanged. Download Boost and enjoy your PC. Remove BabylonToolbar from your PC. Why should I uninstall BabylonToolbar? Removing unwanted toolbars is usually a good idea. The Babylon Toolbar, along with many browser plug-ins, has the potential to cause stability issues within the web browsers they load into, effecting overall PC performance. The Babylon Toolbar can monitor your search queries and browsing habits in order to send you targeted ads and modify your search settings and results. Publisher:              (Not verified) Babylon Ltd.
To the right of the list item, click the Uninstall button and Boost will completely remove BabylonToolbar from your PC. Use Add/Remove Programs control panel in Windows makes to uninstall BabylonToolbar. Follow the appropriate instructions below to use this control panel. Select BabylonToolbar from the list of programs, and click Uninstall. Alternatively, right-click the program and select Uninstall. Select BabylonToolbar from the program list, and click Uninstall. Alternatively, right-click the program and select Uninstall. Select BabylonToolbar from the list of programs and click Remove. Boost helps you remove BabylonToolbar and clean your PC.